Cake. The very word softens even the most sour of dispositions. Cake is a constant in our lives. We eat it for celebrations, holidays, and for after dinner dessert. It’s the treat we give ourselves when we reach a goal in life. It just makes us happy. During Antiquity, the first known cakes were more bread-like and sweetened with honey, nuts, and dried fruits. According to food historians, the ancient Egyptians were the first people to show evidence of advanced baking skills. The round cakes we know today descended from these ancient cakes. Breads and cakes were made by hand and typically shaped into round balls and baked on hearthstones or in low shallow pans. The dough naturally relaxed into rounded shapes. Ancient breads and cakes were usually used in religious rites. They were formed into special shapes, according to the ceremony. The rounded shape typically symbolized the cyclical nature of the seasons, life, the sun & moon. The English word cake can be traced back to the 13th century. The word cake comes form ‘kaka‘, an Old Norse word. (Norsemen [Vikings] were rather frequent, if unwelcome, guests to Brittania from the 8th through 11th Centuries. They took a lot, but the left a lot behind as well. Language and food being two of those things.) Medieval European bakers made fruitcakes and gingerbread that could last for many months. 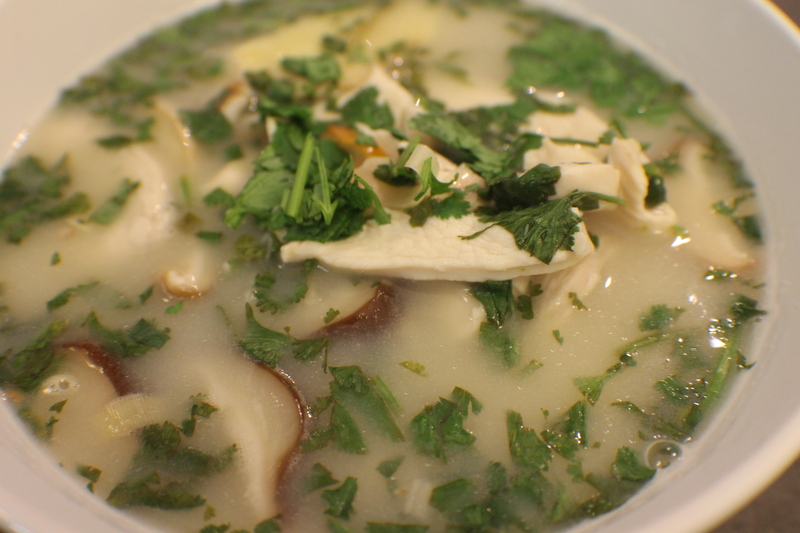 A necessity due to the lack of refrigeration and the purely seasonal nature of cooking and available ingredients. The precursors of modern cakes (round ones with icing) were first baked in Europe during the 17th Century. This primarily due to better & more reliable ovens and ingredients, such as white sugar and spices, were easier to obtain (at least for the upper classes). At that time cake hoops–round molds for shaping cakes that were placed on flat baking trays–were popular. They could be made of metal, wood or paper. As time progressed, baking pans in various shapes and sizes, became readily available to the general public. The term “icing the cake” comes from the first icing recipes. These were usually made with the finest available sugar, egg whites and flavorings that were boiled together. The icing was poured over the cake then returned to the oven. 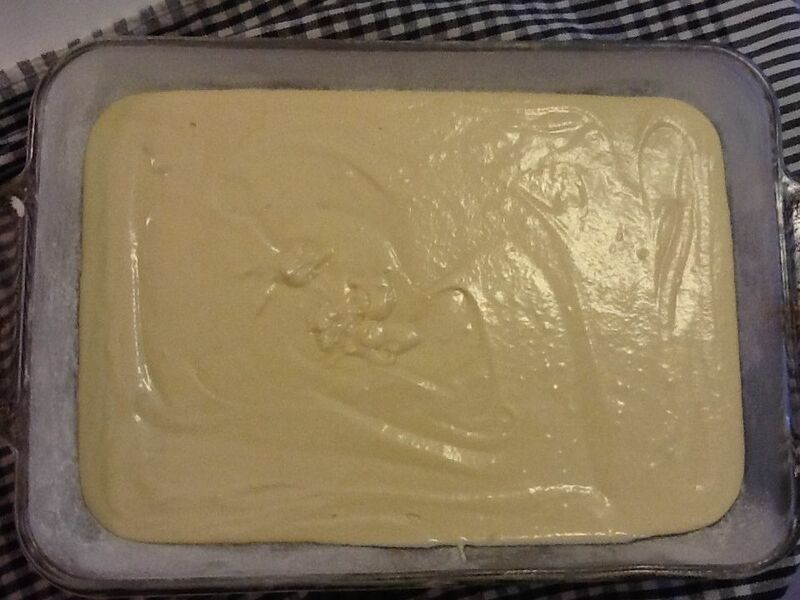 When the cake was removed from the oven, the icing cooled quickly to form a hard, glossy (ice-like) covering. Many cakes made then still contained dried fruits (raisins, currants, citrons). It was not until the Victorian era that the cake as we now know it (made with white flour and baking powder instead of yeast) became popular. Commercial cake mixes have been around in one form or another since the 1920’s. But, they reached the height of popularity in the 1950’s when quick & instant foods became popular with housewives. Cake mixes are easy, mostly foolproof, and inexpensive. However, there’s really nothing like making a cake from scratch. If you simply follow a few guidelines, there’s nothing that can stop you from making a delicious show-stopper. To begin with, you must use quality ingredients. 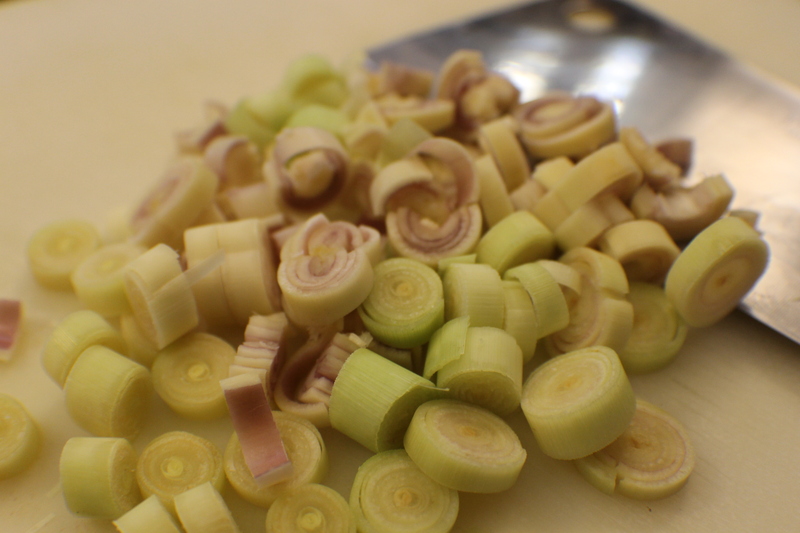 If your ingredients aren’t quality, all your work will be for nothing. 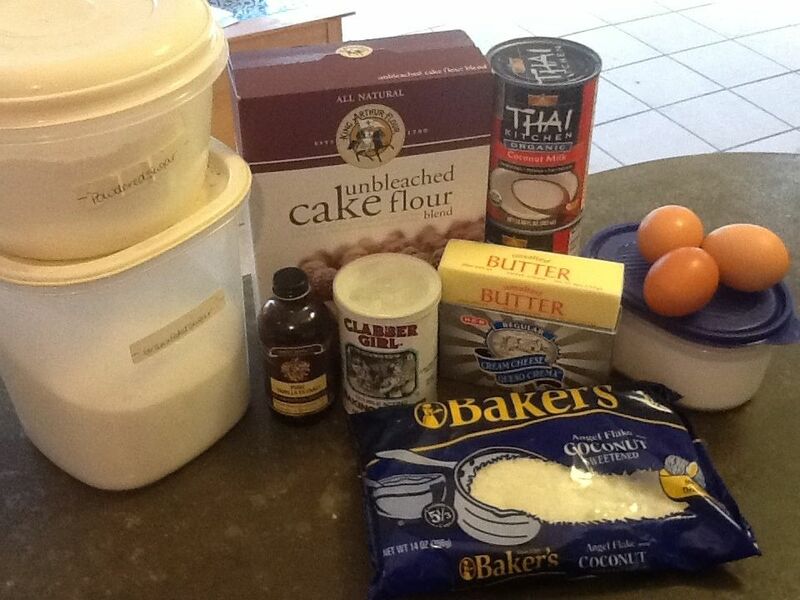 Flour: For cakes, cake flour is best. It’s what’s called a “soft wheat” flour that has a low gluten content (about 8%). Using cake flour creates a much lighter, moist cake. 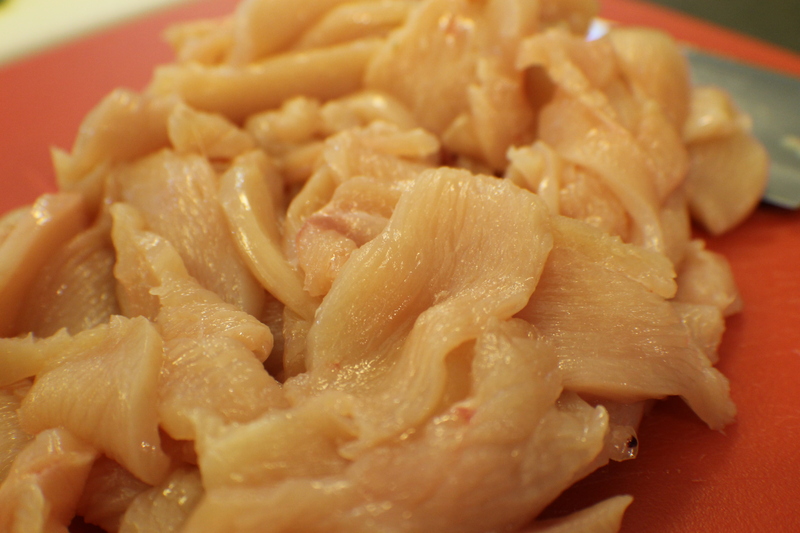 It is generally available in 2-pound boxes and comes in both bleached (i.e. Swan’s Down) and unbleached (i.e. King Arthur). 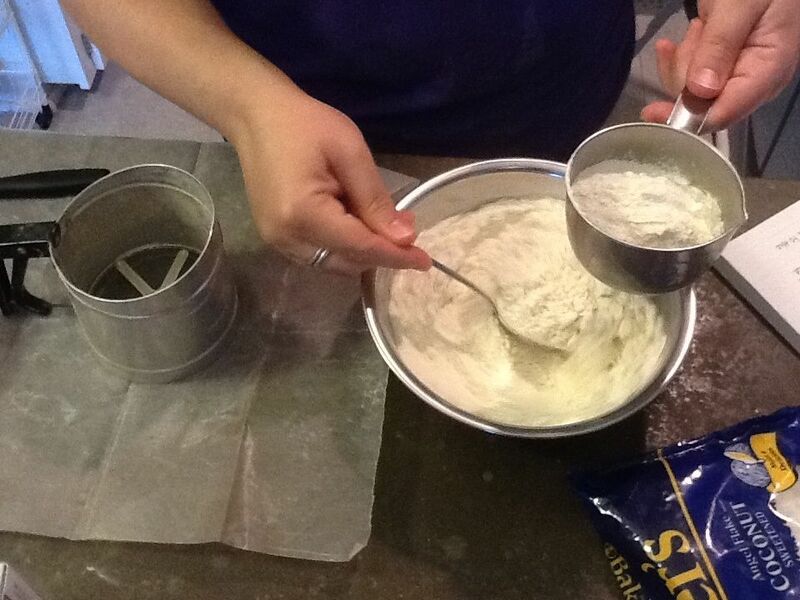 Because cake flour has a tendency to clump during storage, you must always sift it before using it in a recipe. I prefer to use unbleached because, well, it hasn’t been treated with bleach. You can use all-purpose flour in a cake recipe, but because it is a heavier flour, your final cake may not be as moist. If you must use all-purpose flour, one trick to making the cake lighter is to sift the flour 3 times and then use the scoop & sweep method to measure it (see recipe). 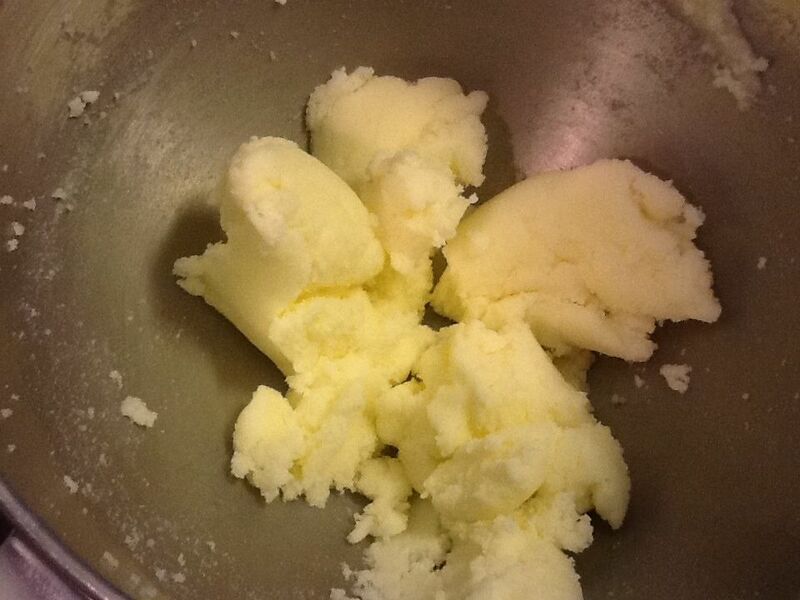 Butter: Unless a recipe specifies otherwise, always use unsalted butter. If you can, use European or European-style butter. Commercially available American butters must have a minimum of 80% butterfat, while European and American made European-style butters have a minimum of 88% butterfat. The amount of butterfat does make a difference. It results in a richer, more flavorful cake. 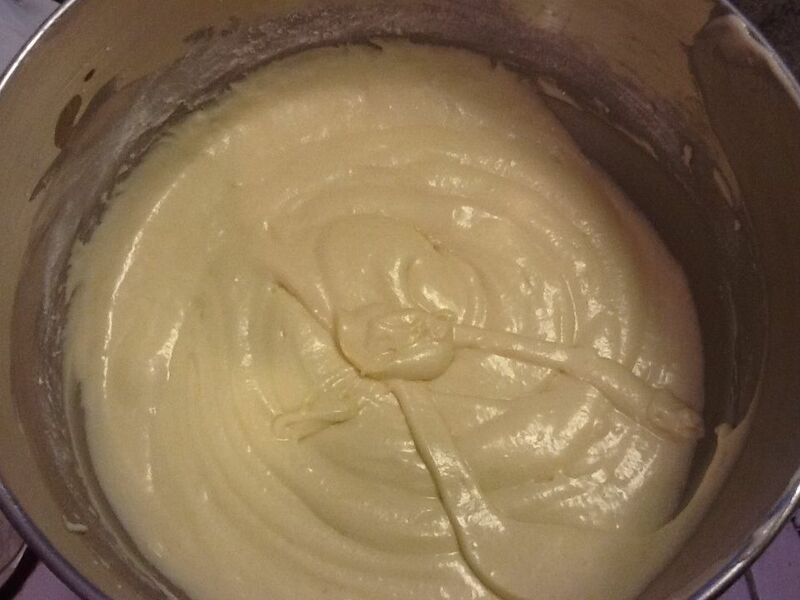 Do not substitute margarine or light butter in a cake recipe. Margarine can be unreliable in a recipe and is completely lacking in flavor. Because it’s not a natural product, it is in many ways, less healthy than butter. Light butter contains only about 50% butterfat, with the rest made up with moisture, gums, stabilizers, and emulsifiers. It is not recommended for cooking or baking. Eggs: Unless a recipe specifies otherwise, the eggs called for are always going to be large eggs. A large egg is exactly ¼-cup. 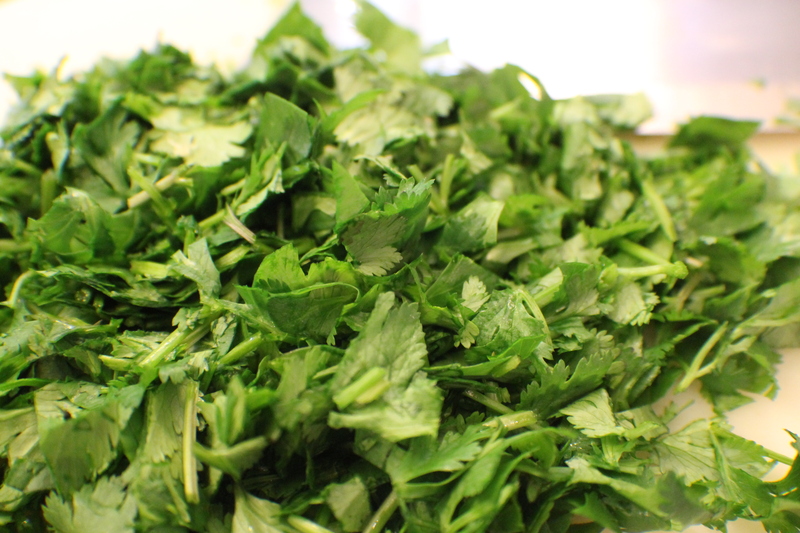 And, like with any ingredient, fresher is better. Check the expiration date on the carton. It makes no difference whether you use white or brown eggs. Salt: I generally use kosher or sea salt in my recipes. They are minimally processed and have no additives. Table salt (i.e. 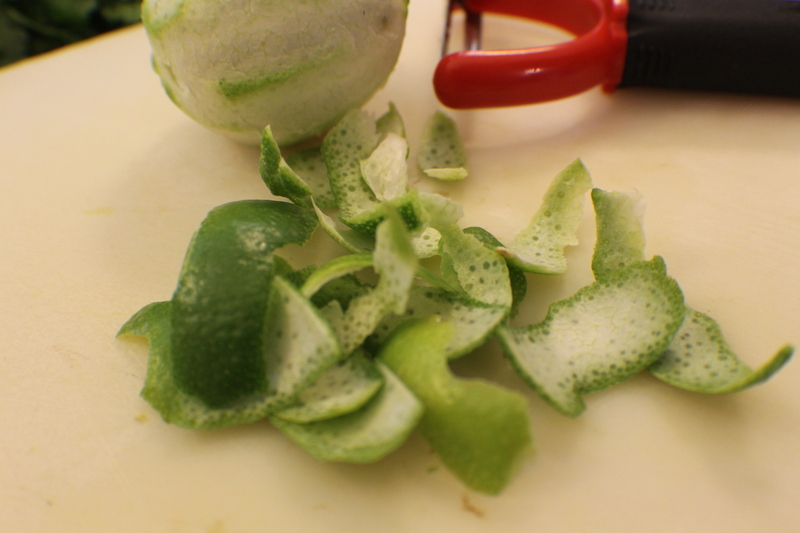 Morton’s) has additives that help to keep it from clumping. 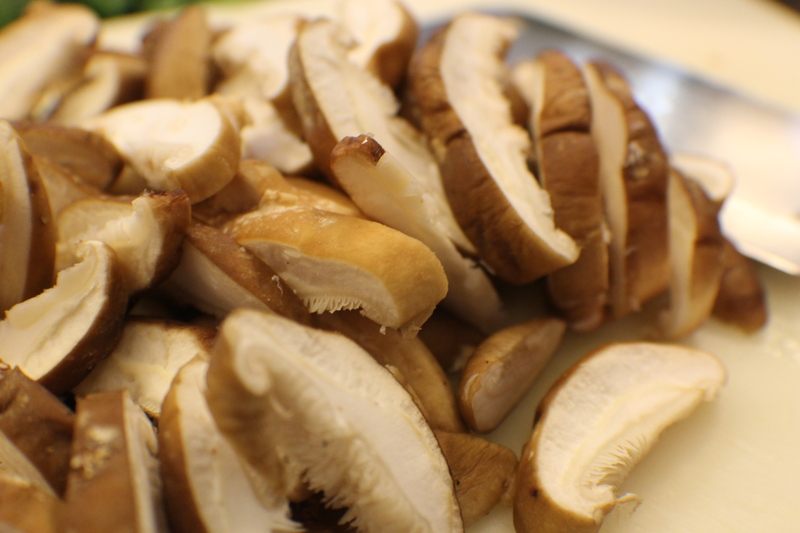 These additives can add a bitter flavor to what you’re cooking, however. So, save table salt for the table. Extracts: Always use pure extracts. These are distilled from the essential flavors of vanilla beans, flowers, nuts, and coffee. Artificial, or imitation, extracts are usually made with ingredients like petroleum and coal tar. Not very appetizing. Plus, imitation extracts have a fake approximation of the flavor you’re trying to enhance in your baked goods and can potentially ruin the flavor of your recipe. 1. 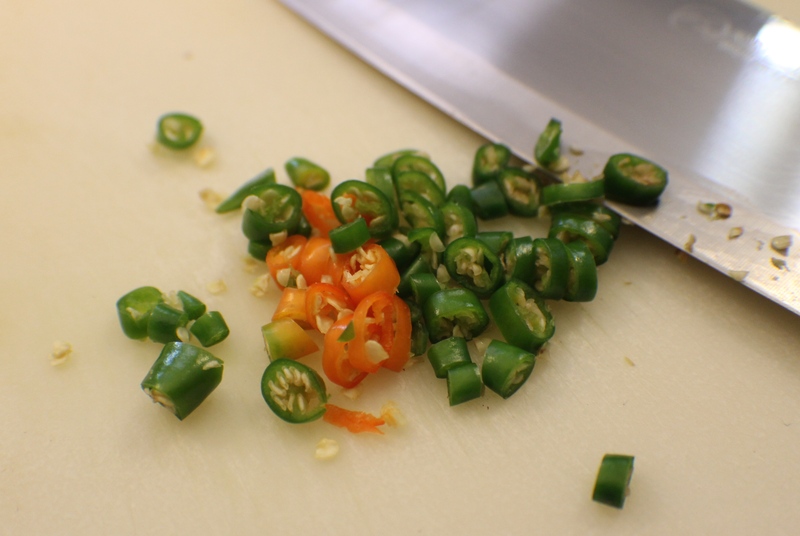 Be sure all your ingredients are at room temperature. This will help your cake batter blend into a more even mixture. 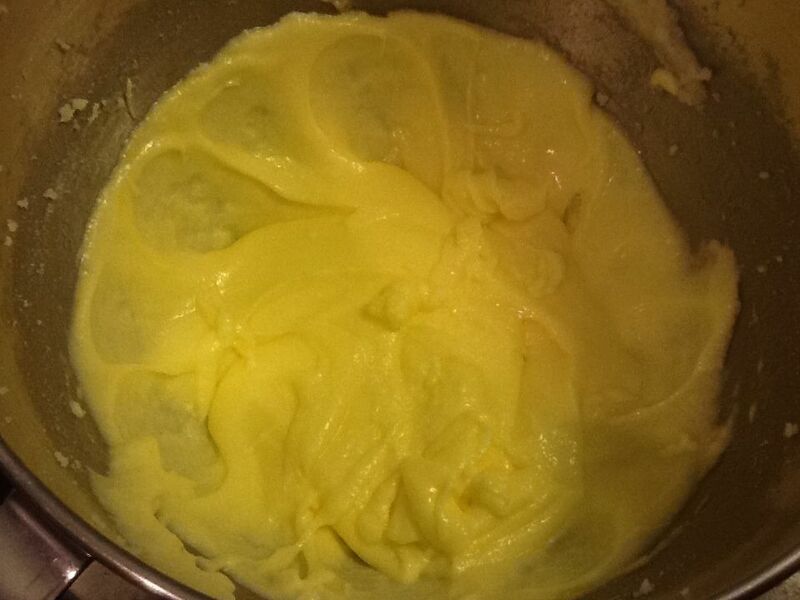 However, when it comes to butter, do not use melted unless specified in a recipe. Melted butter separates and can make your cake greasy. 2. 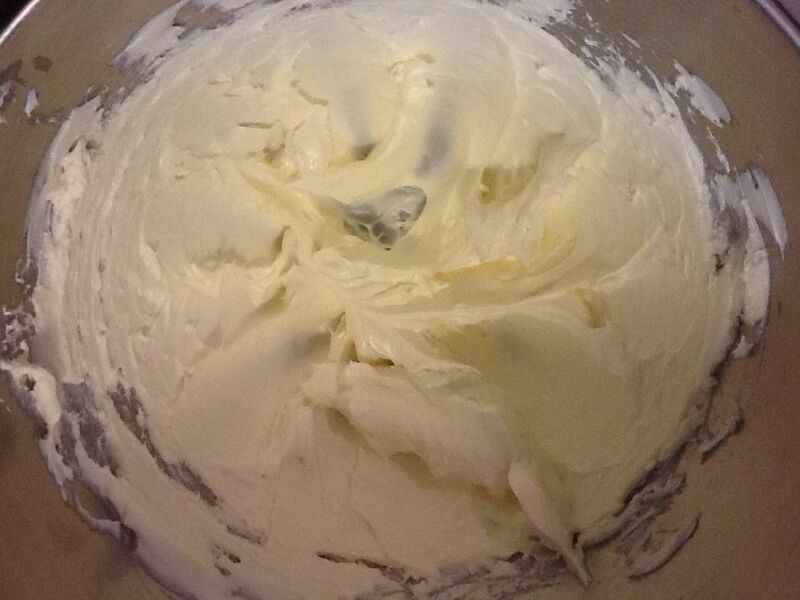 When you cream together the butter and sugar, be sure that it becomes a light, fluffy mixture. The added air helps to make the cake lighter, and produces a less dense cake. 3. Be sure that the eggs are added one at a time and the batter is thoroughly blended after each egg. Otherwise, your cake will be dense and flat. 4. Be sure you use the correct size pan for your recipe. 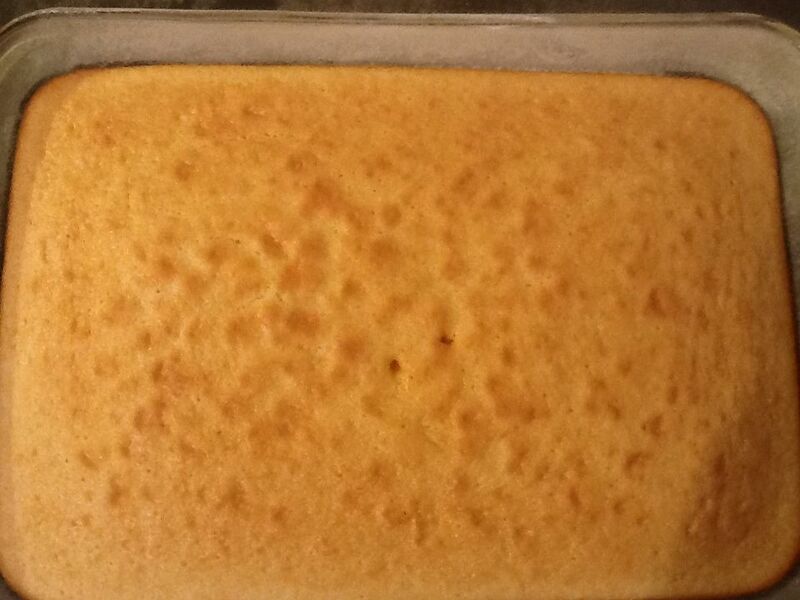 Too much batter in the pan, the outsides of the cake overcook before the middle is done. Too little batter, your cake can overcook and have a crispy crust. 5. Make sure you adjust your oven temperature so your cake will cook evenly and thoroughly. *Remember, oven temperatures in recipes are for the ovens used to test the recipe. Everyone’s ovens cook differently. You know whether your oven cooks hot or cold. 6. If you have more than one cake pan in the oven at a time, be sure the pans are not too close together. Otherwise, they will bake unevenly because there’s not enough hot air circulating around the pans. 7. If your oven cooks unevenly, and most ovens do, about half way through the baking time, rotate the baking pans, and/or, if you have more than one pan, switch racks. 8. Always let the cake cool completely before adding any frosting or decoration. In this cake recipe, I have a rather unusual ingredient, coconut milk. 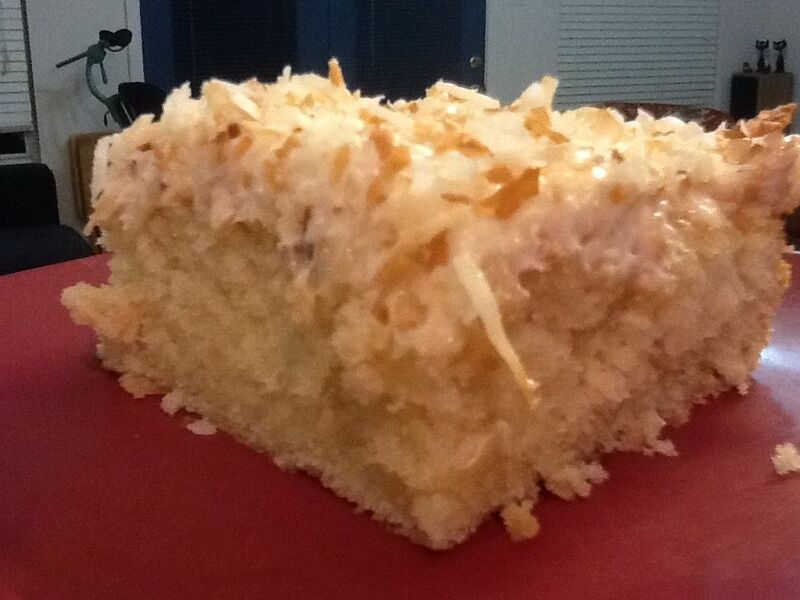 Since this is a coconut cake, I wanted to take the flavor to the next level, so to speak. Since coconut milk is heavier, viscosity-wise, than whole (sweet) milk, this does result in a slightly denser cake. 1. Preheat the oven to 350F. 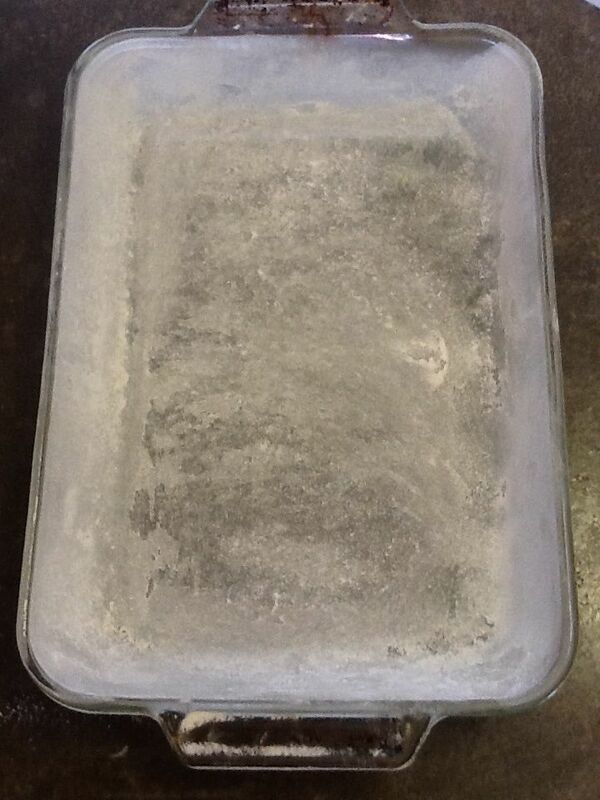 Grease and flour either 2 9-inch round cake pans or 1 12 x 18-inch baking pan. Set aside. 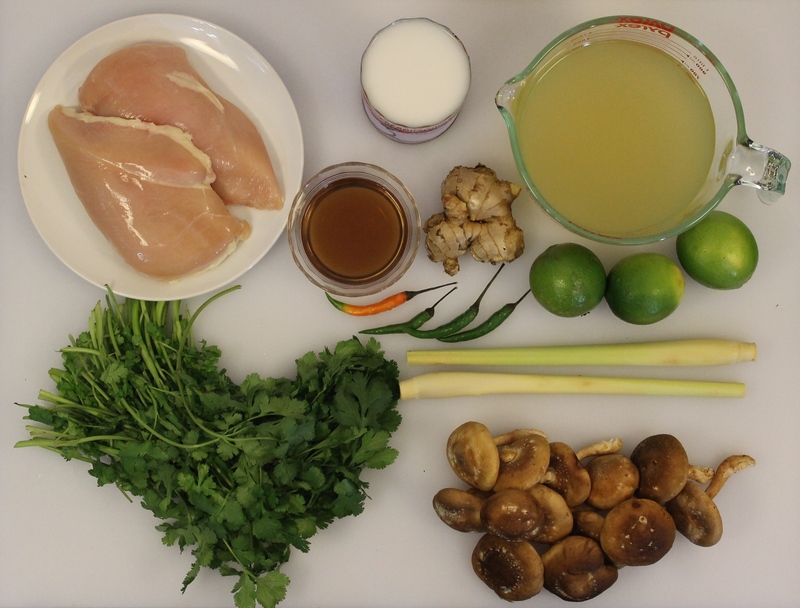 The prepared pan. I opted for a single layer cake because it's easier. Note: My Preferred way to measure the flour for cake is to pour some flour (not necessarily measured) into a bowl. I aerate the flour and then scoop the flour into a dry measure (looks like a scoop or dipper). Do not tap the measuring cup to pack the flour. This will make a heavy, dry cake. Once I have filled the cup with flour, I simply sweep the excess off the top. Scooping the aerated flour into the dry measuring cup. 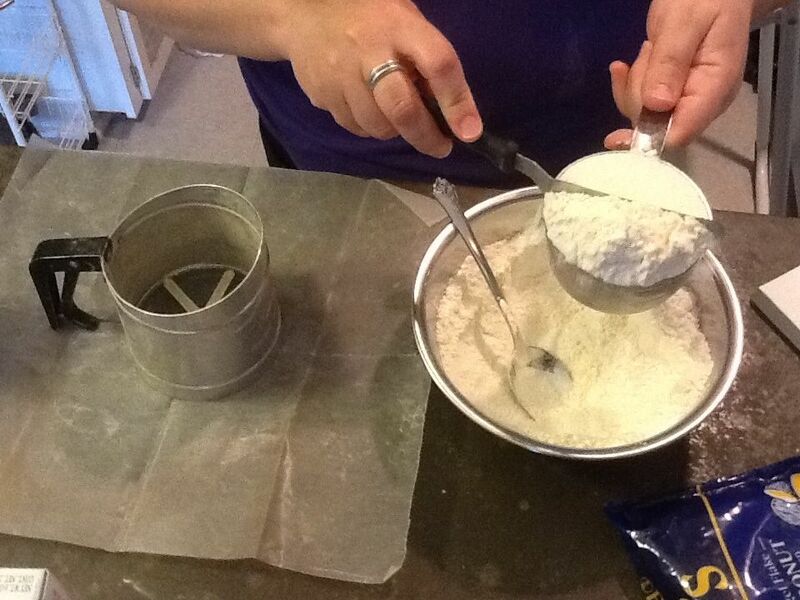 When scooping the flour into the cup, do not pack it down. If you do, it will result in a heavy, dry cake. 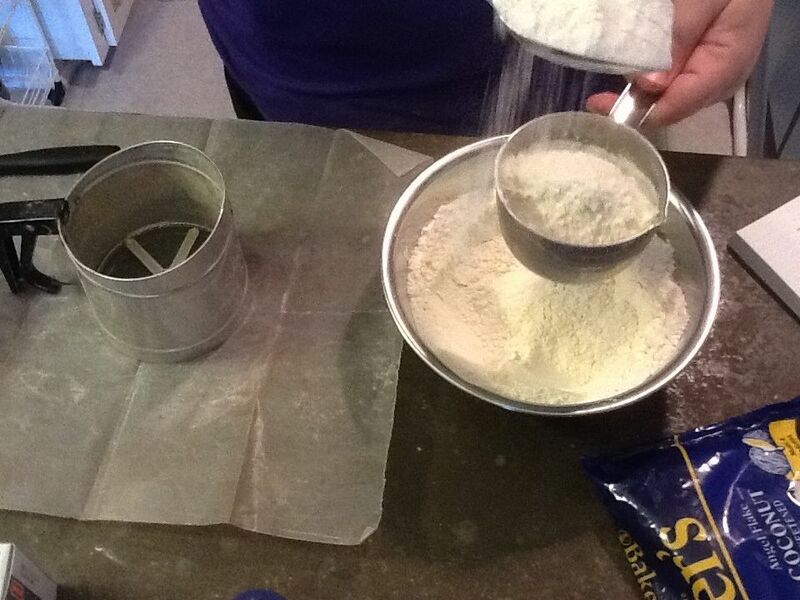 After measuring the flour, simply sweep off the excess flour. Do not tap or shake the cup to pack it down. 2. Sift together the flour, baking powder, and salt. Set aside. 3. In a large bowl or mixer bowl, beat together the butter and sugar until light and fluffy. After the eggs have been added to the butter and sugar. 5. 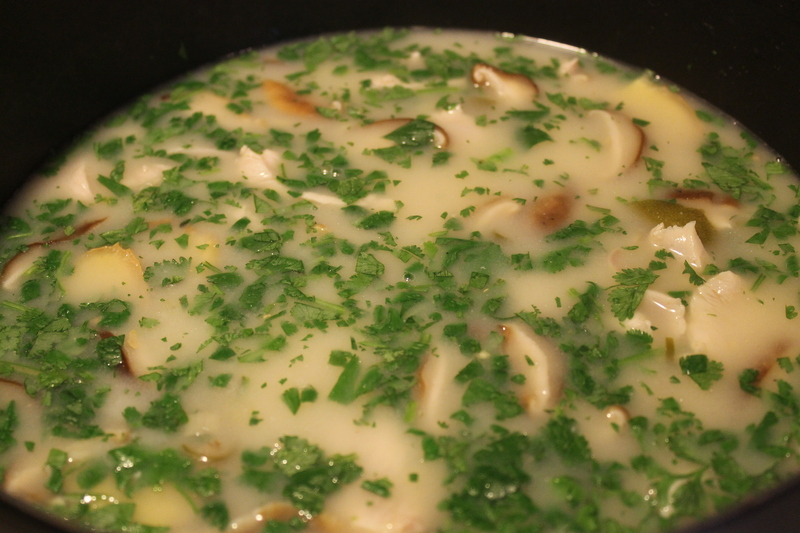 Add the flour mixture and coconut milk, alternating between each addition, to the butter mixture. (Alternating the wet & dry ingredients makes a more thoroughly mixed batter.) 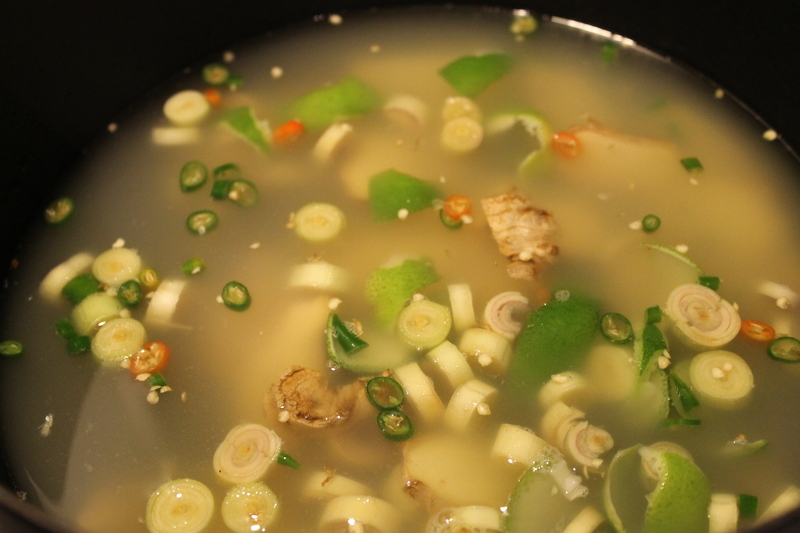 Be sure to scrape down the sides of the bowl often. 6. 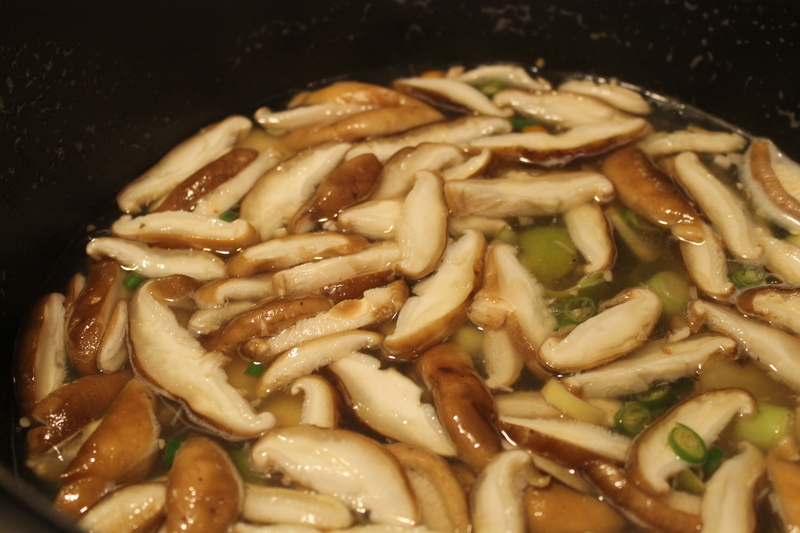 Pour the batter into the prepared pan(s). Batter in the prepared pan. Be sure it is evenly distributed. Bake the cake for 30 – 35 minutes or until a tester inserted into the center of the cake comes out clean. Let the cake cool in the pan(s) for 10 minutes, then turn the cake out onto a rack and let it (them) cool completely before frosting. The finished cake. The holes in the top are where I tested it for doneness. 7. Make the Frosting: In the same 350F oven, toast the coconut in the oven on a large sheet pan until it is golden brown, about 10-12 minutes. 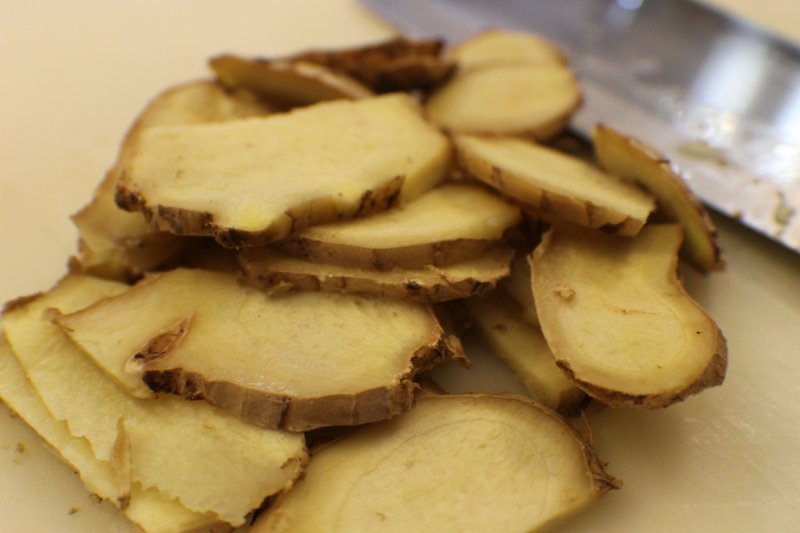 Stir every 2 – 3 minutes to be sure the coconut browns evenly. 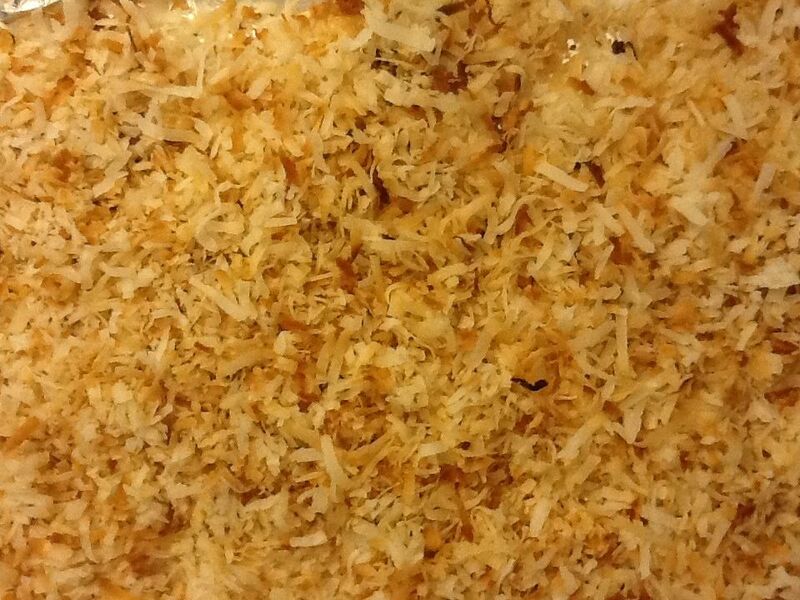 Remove the coconut from the oven and immediately take it off the sheet pan and place it on a cool surface. 8. In a mixer bowl, beat together the butter and cream cheese until smooth and creamy. Mix in the powdered sugar, coconut milk, and extract. Mix well. Finished frosting right before the coconut is added. Stir in 2 cups of the toasted coconut. 9. Spread the coconut frosting on the cooled cake. 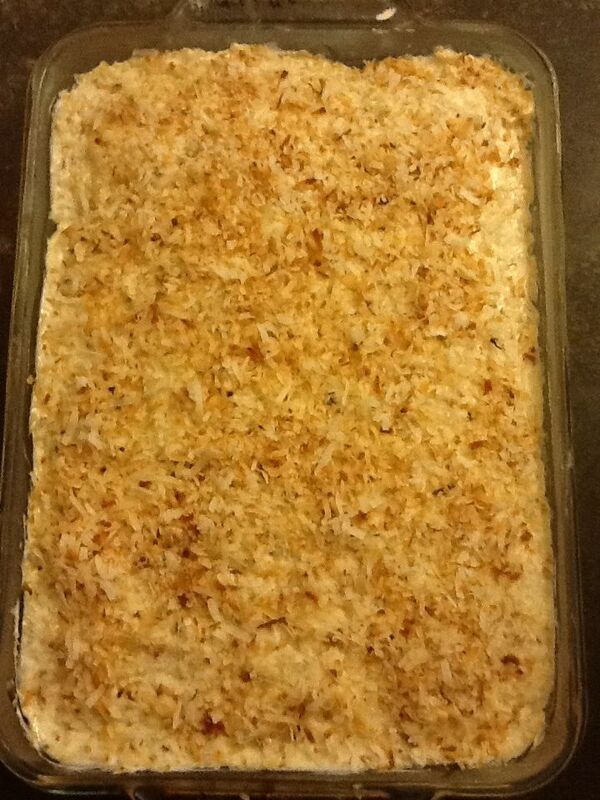 Take the remaining 1 cup of toasted coconut and press it into the top and sides of the cake. The final, frosted cake. I put the cooled cake back into the same baking dish. By the way, this cake would be excellent with some tropical fruit salad on the side or some chocolate drizzled over the top. Or, just eat it as is.